From all accounts we've witnessed, North Korea is a seemingly oppressive, self-sheltered and isolated country dominated and controlled by one very questionable and delusional self-proclaimed supreme ruler. Seemingly every aspect of the country is coordinated, monitored, audited and examined down to the T. Every little detail is shaped and formed by the powers above, and this whittles down to everything from the country's laws, political system, education system and even the architectural form that encompasses it. As King Jong-il detailed in a 160-page treaties On Architecture (1991), "the basic condition for harmonizing all the city's architectural space is the focus on the leader's statue and ensuring that the statue plays the leading role in the architectural formation of the city." It's this obsession with creating a cult of personality that has led the supreme leader to erect not just in towering statues or mass gatherings, but to curate this sense of overriding rule in the design of its architecture too. And strangely, that architecture is eerily pleasant on the eyes! 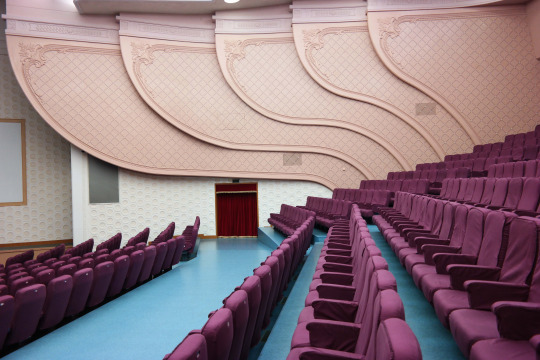 With pastel colour palettes and axial symmetry, London-based architecture critic Oliver Wainwright has hit the nail on the head with this analogy: "the feeling of walking into a Wes Anderson film set." Take a look for yourself and see what you think. 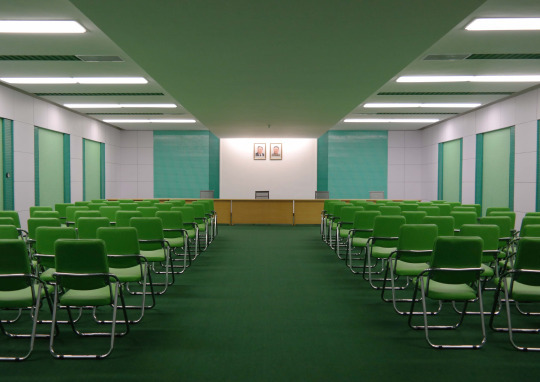 We particularly love the look of the brown leather chairs in the bizarre football boardroom meets locker room-room, as well as the curved art-deco inspired walls in the National Theatre! Check out the rest of Oliver Wainrights trip to North Korea here.